Boulder City High School’s boys tennis program figures to be in the driver’s seat again after claiming its first 3A state championship since 1977 last season. 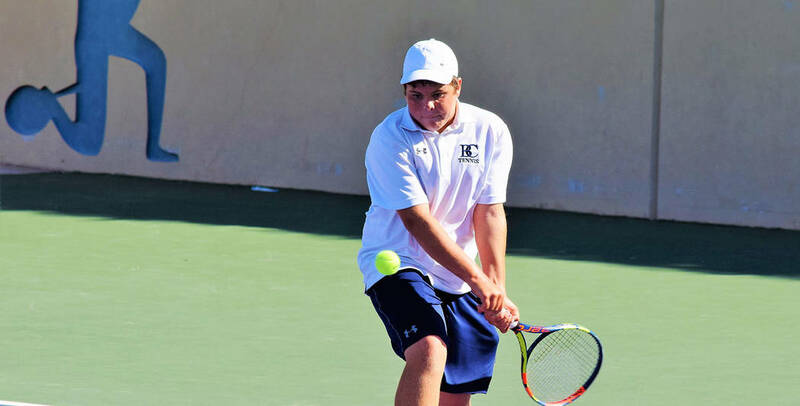 Robert Vendettoli/Boulder City Review Junior Connor Mikkelson, who placed third at state last year, is expected to be a key contributor to Boulder City High School's boys tennis team this season. The Eagles’ experienced core that went 20-0 in league play the past two seasons is ready for another state title run. The Eagles will have to replace key contributors Andre Pappas, Clayton Pendleton and Sam O’Berto, but head coach Rachelle Huxford said she is confident in her returning players. Back this year are juniors Connor Mikkelson and Breton Erlanger, who made state final appearances last season in individual play. Mikkelson placed third at state. The junior doubles tandem of Preston Jorgensen and Boen Huxford finished third at state and could be even more dominant this year if they stay together. Also expected to play doubles will be senior Karson Bailey and junior Ty Pendleton, although their partners for this season have yet to be determined. Jorgensen could spend some time by himself this year, while German exchange student Philipp Zengl could earn some playing time as well. The Eagles will be tested right out the gate in the newly constructed 3A division, facing The Meadows in a state championship game rematch. Boulder City will play every 3A team once this season.